What Is Planets of Light? Planets of LightTM is a system developed by Elizabeth Jones where you discover that the Planets are Great Cosmic Beings—some say of the Angelic Realm—that act as Guardians of the Planetary Portals for the Great Uncreated Light. Planets of Light has a most sacred purpose and that is to activate and expand your Light as perhaps it has never been done before…the Light that is the counterpart to the Light of your Higher Self. This Light was bestowed to you at birth and is imprinted upon the very atoms and deepest memory of your being. The system Elizabeth developed in Planets of Light (PoL) can set you firmly on the path to fulfilling your purpose at this significant time of planet Earth’s destiny. You can purchase Planets of Light with or without CDs. The alchemical agent that ignites your inner Light is first clearly set with your intention to do so ~ Tools for doing this are included in the PoL eBook. Determine which planet you want to engage based on the issues you are facing—such as fear, lack, anger, melancholy, confusion, etc. ~ The PoL Reference Guide is an excellent tool for determining which issue you want to work on. Next you’ll discover how to Invoke the Planetary Being that you want to work with ~ Find out how in the PoL eBook and on the audios-MP3s for each Planet. You are then given tools to strengthen your resolve and enhance your success ~ Found throughout the eBook and on the audio-MP3s. Each Planet carries a particular signature and has rulership over specific areas of life. The exact qualities and nature of your Imprint of Light is determined by the specific energy of each Planet at the time you took your first breath. There are infinite patterns and combinations, responsible for creating each of us as unique individuals and expressions of the Light. This imprint is also reflected in your natal chart. Planets of Light eBook ~ An 85 page, beautifully designed, easy-to- read and print-friendly PDF with information on PoL, how to use it, the origin of this amazing system and more. 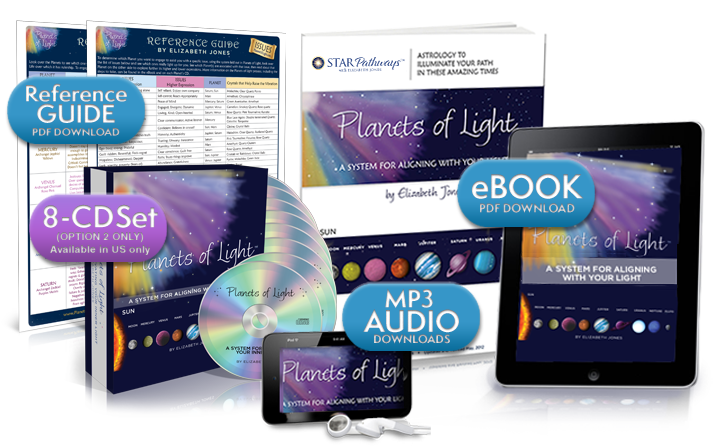 Planets of Light Reference Guide ~ A two-page print-friendly PDF listing issues, with their corresponding planet, the lower and higher frequencies to be aware of and the Archangels, crystals and colors associated with each issue listed. Eight audio CDs, which you can purchase as either downloadable MP3s or as CDs (which also includes the MP3s )~ Includes the higher and lower expressions, invocation and more for each planet. Plus how to work with the Great Planetary Beings to assist you with various issues and more. A deep part of each of us knows we are being sought and called Home, and it is my hope that this material will resonate within you and perhaps even feel familiar and comforting. I believe it is no mistake that you found your way here! For the Light within you is now ready and waiting to be ignited.